Pop Up Theatre presents, GIVING UP THE GHOST, by Rivka Hartman, in the Limelight Theatre on Oxford, Oxford St., Darlinghurst. 17th October - 3 November. 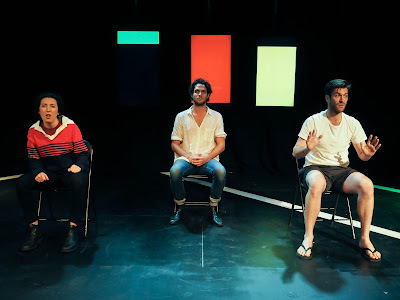 GIVING UP THE GHOST, is a new Australian play, by Rivka Hartman. 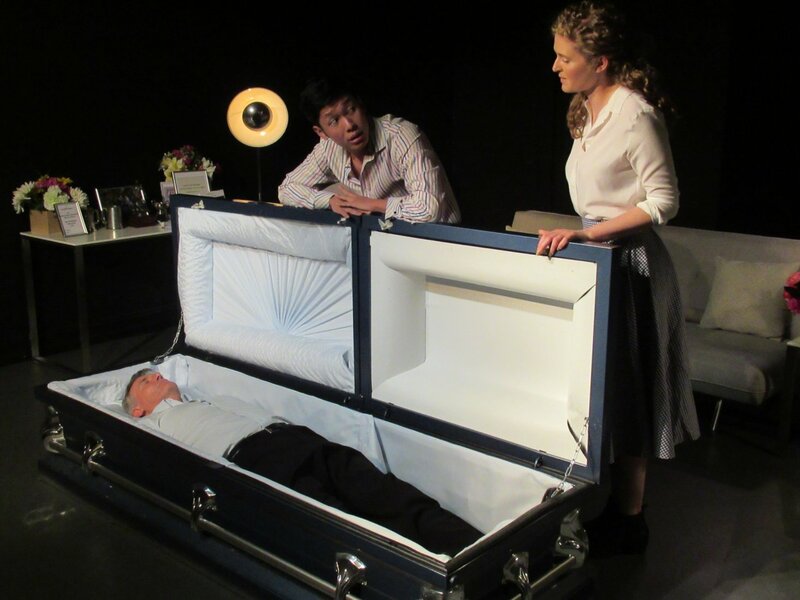 A husband (Chris Orchard) is dead and in a coffin at home. His wife (Elaine Hudson) is preparing for the mourning. Her daughter (Madeline Withington) has the option of a bright future in research at a University but is caught up in a relationship with a wealthy distractor (Andrew Wang). Neither parent are happy about this. The wife conjures the spirit of the husband and together attempt to strategise the ways and means to lose the boyfriend. The major part of this play has the aura of a Jewish 'New Yorky' comedy but neither the writing, nor the Direction, from Rivka Hartman can find the right tension and timing to bring it to life for the audience. The play works best when the emotional 'kicker' for all this delusional affect is revealed - that the Wife, also a Doctor, has assisted her Husband to death. Euthanasia. He was suffering from terminal cancer and she, now, has a worrying sense of guilt - this dramatic edge was the best part of the night. GIVING UP THE GHOST, is the first production in a new performance space in Sydney: LIMELIGHT on Oxford, run by Julie Baz and David Jeffrey. It is a pleasant space on the top floor of a three storey terrace in Oxford St - 58 seats. A Bar and Restaurant on the ground floor and a live music and bar space on the first floor. Next up, at LIMELIGHT, is a production of the musical COMPANY. Bite Collective and the Old 505 Theatre presents, WHOSE UTERUS IS IT ANYWAY?, by Georgie Adamson, at The Old 505 Theatre, Eliza St, Newtown. 30th October - 10th November. 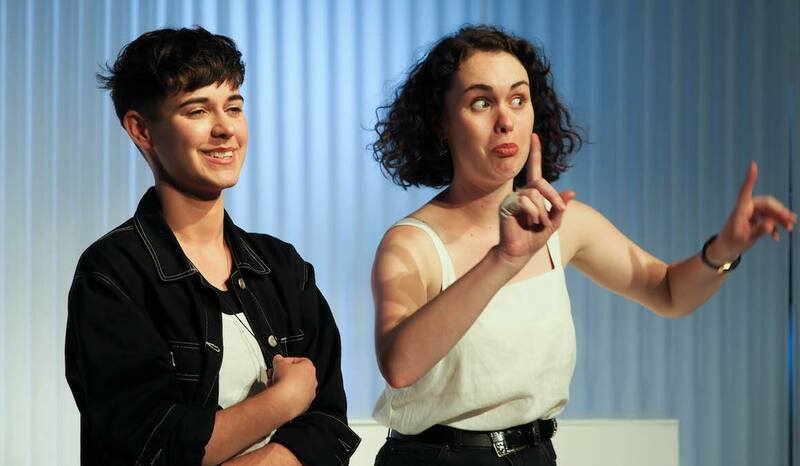 FreshWorks Femme is a brand-new initiative, bringing together some of Sydney's fiercest young female theatre makers exploring new ideas and how they view the world. The Creative Team has Eve Beck, Directing; Madeline Osborn, Producing; Camille Ostrowski as Set Designer, and of course, Ms Adamson as the writer. Martin Kinnane, is the Lighting Designer and Alexander Lee-Rekers is the Sound Designer. WHOSE UTERUS IS IT ANYWAY? is set within the frame-work of a television Game show where four contestants compete against each other for their free reproductive health treatment. There is only one winner. A young mother, Lila (Annie Stafford) with two young children and a disintegrating marriage; a single, uncommitted to any aspect of her life, by-habit, narcissist, Michelle (Chelsea Needham); Tom (Finn Murphy) a transitioning female-to-male; and a young nun, Mary (Ally Morgan), are the contestants. Clearly, the range of 'types' fits within the notorious boundaries of contemporary Reality Television, as well - wildly diverse. The host, frontman-'stooge', is Toby Blome. He regales them, in turn, with 'provocative' questioning and in each case they are taken into vicarious re-enactments from their lives to clarify how and why they are seeking the health treatment. The advertising 'blurb' for this play tells us that it 'pokes and prods at the intricate invasions and sinister ridiculousness of reproductive health care', giving an indication that in this set-up of the Game Show/ Reality Television format, that some serious reveal and political gestures will be made about contemporary women's health issues. They also promise that: 'We'll (OOPS) get right deep down to dirty secrets and messy details'. It is the latter tone, the OOPS, that dominates the body of the writing and the skills of the actors. Says the 'blurb': 'What happens when an IUD, and STI and an abortion walks into a bar?' A question for a jokey punch line. It is the question and the jokey punch lines - clever, though they are - and a huge weight of afternoon television melodrama, that takes up the bulk of the writing and the style of acting. It is an entertaining light-weight experience, and at 90 minutes, in need of the blue-pen of the editor. The actors, generally, stride the satiric send-up of the undergrad humour of observation of television mediocrity and the soap-opera style of 'naturalism', with varying competencies, and, unfortunately, with, for them as artists, not much material of real bite for political intensity and challenge. The title of the play: WHOSE UTERUS IS IT ANYWAY?, is the most provocative text in the play. Good fun is had by all. Especially, Toby Blome, who not only carries the Compere with great, sustained, cheesy élan, but also plays a huge variety of pencil-thin characters in the soap-opera re-enactments. It is a busy show to stage technically with all of its shifts of location and styles, and Director, Eve Beck, manages it, within the limitations of the budget, fairly well, with Martin Kinnane delivering with his usual meticulousness, lighting cues to keep it all attractive and 'moving forward', aided and abetted by Alexander Lee-Rekers' Sound support. There was not much bite from this Bite Company production. It pandered to the ridiculousness of contemporary mediocre television that dominates our viewing opportunities, and, relatively, neglected the opportunity to seriously challenge and educate its audience with the cultural ignorances of the every day real dilemma of being a woman with issues that concern their health, let alone their uterus. 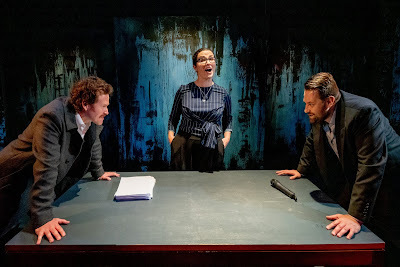 Watching this play I was reminded of the Paddy Chayefsky script for the 1976 film, NETWORK, Directed by Sidney Lumet, starring Peter Finch (recently staged as a play in London), where the Game Show was used as framework for a fierce social critique. It was horrifyingly amusing and damned confronting in its philosophical musings. WHOSE UTERUS IS IT ANYWAY? does not honestly represent "Sydney's fiercest female theatre makers exploring new ideas', the stated aim of this inaugural work for the FreshWorks Femme season. 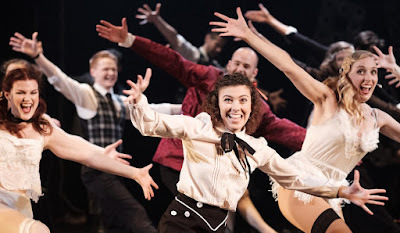 Nor, did, by-the-way, the recent STC production of ACCIDENTAL DEATH OF AN ANARCHIST, give us anything too fierce to deal with. So, might I recommend Betty Grumble's, LOVE AND ANGER. Now there is FIERCE. And you can get to see it at the Griffin SBW Stables Theatre early in February next year. 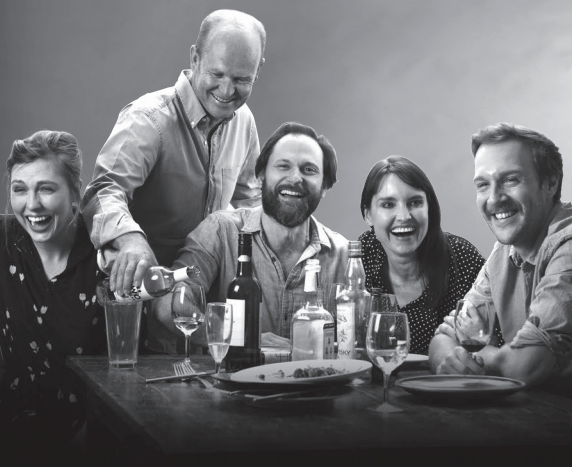 The show at the Old 505 Theatre is a light weight escapade - a silly night in the theatre, easy to enjoy. Ninefold present WYRD - The Season of the Witch, Devised by the company, Ninefold, at The Pact Theatre, Erskineville. 31st October - 3rd November. 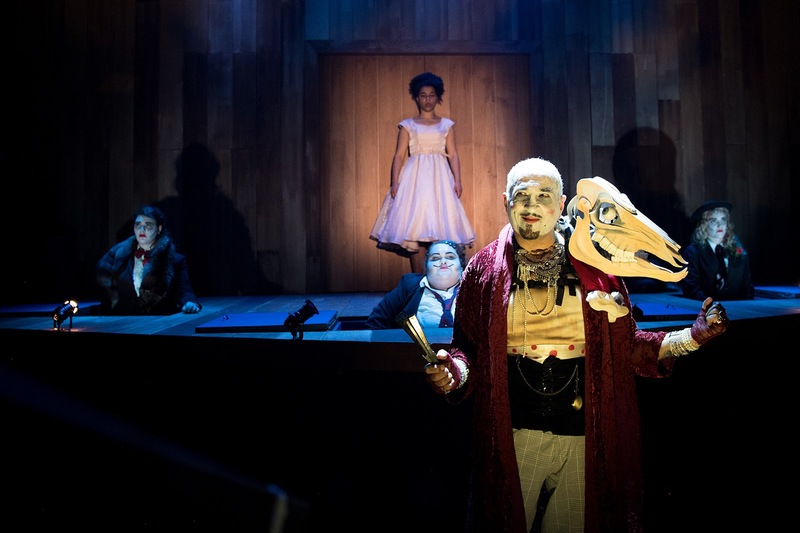 WYRD - The Season of the Witch, is a new Australian work devised by the company Ninefold, under the Direction of Shy Magsalin, inspired by the Suzuki Method of Acting Training. It has an intense physical centre married with an intellectual approach to text. Ms Magsalin has worked and trains regularly with the Suzuki Company of Toga (SCOT), Japan, and through her further training at the University of Western Sydney has been exploring the form and content of MACBETH. The ensemble's relationship with MACBETH began in 2013 with their project: MACBETH: 9 SCENES REHEARSED. 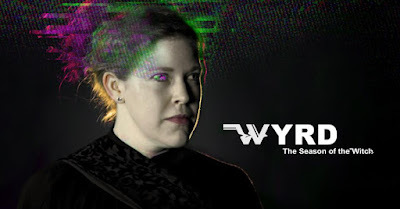 This version of the project , WYRD, has been almost 2 years in the making and has been specifically assisted by an atPACT Residency. atPact is for companies exploring new ideas, new performance platforms and new forms of audience engagement. The discipline and the dramatic power of the physical commitment of this ensemble: Erica Josephine Brennan, Aslam Abdus-samad, Paul Musumeci, Gideon Payten-Griffiths, Melissa Hume, Shane Russon, Jessica Saras, Tabitha Woo, led by Victoria Greiner, as Our Lady, is in a mesmerising state of embryonic potential. The movement techniques and expressions (dance) for the storytelling are beautifully conceived and executed, if not, yet, completely, seamlessly owned by all of the performers. But, vocally the instruments are not all equal and whatever the hard work of the vocal coach, Amanda Stephens Lee, it remains the weak link of the project development. This story places The Lady Macbeth in a push and pull collusion with the Wyrd sisters. 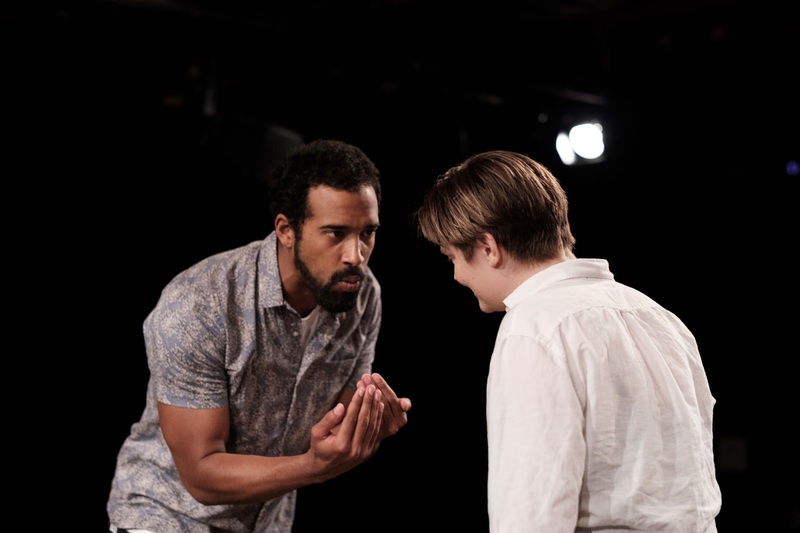 The textual spoken adaptation is pure Shakespeare cut-up and diced for the company's own focus and concentration - well done - to follow the arc of the human tragedy whilst, also dialling up the 'volume' of the horror. Victoria Greiner has the focus, charisma and stylistic bravura to hold the centre of this work steadily - her vocal work and physical vocabulary is disciplined and always meaningfully possessed. Great and easy to watch. She is well supported by all, especially Ms Brennan as Wyrd One (watch her stunning physical finish). Ms Woo, too, is a physical dynamo. Mr Russon gives real gravitas and language clarity in his well focused offers. The atmosphere of the witch craft and magic spells, the horror of the world of the play, is enhanced magnificently, by the Music soundscape of Melanie Herbert - exciting to hear and provoking in its sensitive details The Design by Victor Kalka: Set and Costumes, is stylistically simple but most effective, the Lighting by Liam O'Keefe supplying visual tension and atmosphere galore. The black magic incantations - led by Hecate and her sisters are often edited out of the play - coming from the well lit circle of these players, had me comprehending the superstitious power that this play has emanated throughout the centuries. The infamous curse of the play of Macbeth awesomely respected by most thespians, may well, indeed, be true. That we were seeing it on Halloween Eve heightened the effect even more! WYRD - The Season of the Witch, is a very rewarding hour in the theatre. Crammed with a dense amount of hard work - clearly, the physical training has been intense; , however, the vocal training needs the same commitment in time, focus and discipline. It is a very brief season exposure but well worth the effort to catch. The last time I was at the Pact Theatre was to watch the SheShakespeare version of MACBETH. 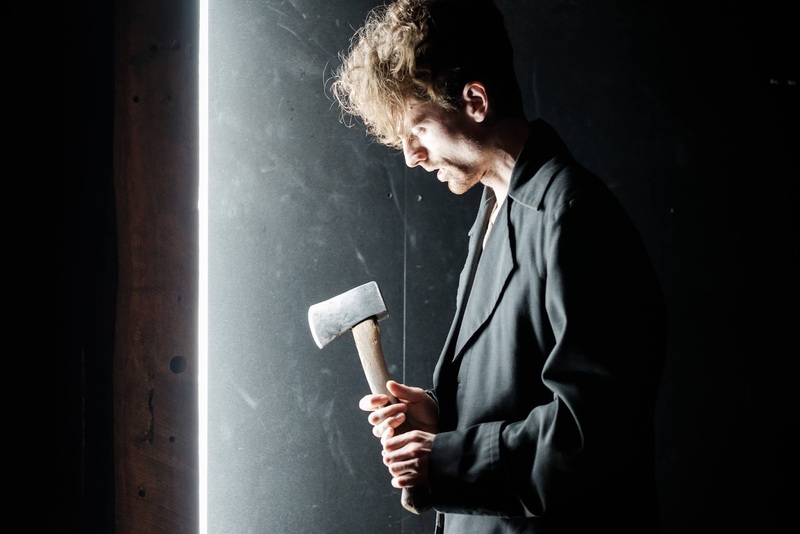 Last time it was a difficult couple of hours, this time Ninefold has a work inspired by the MACBETH play that merits your attention and appreciation. It is on the cusp of 'greatness'. I recommend it. 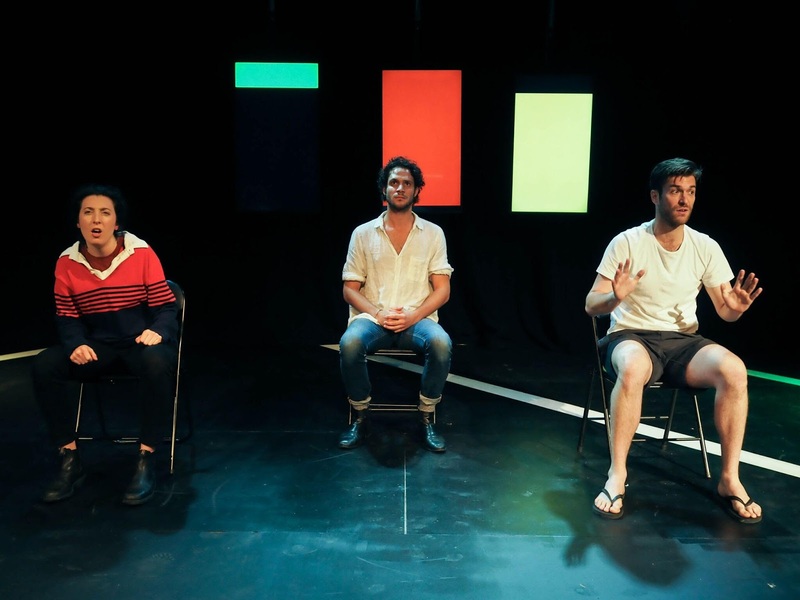 The Anchor, in association with bAKEHOUSE Theatre Co. presents, TWO HEARTS, by Laura Lethlean, at the Kings Cross Theatre (KXT), in the Kings Cross Hotel. 19th October - 3 November. TWO HEARTS, is a new Australian play. 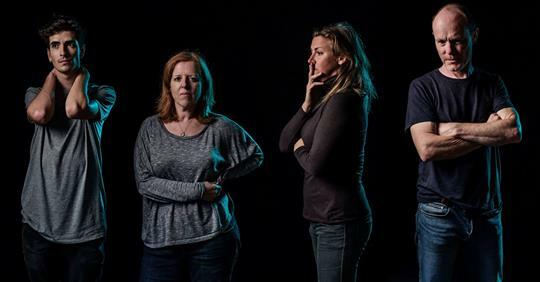 Three recent Drama School graduates, Katie Cawthorne, Jessica Arthur and Laura Lethlean have formed The Anchor company to produce theatre work. 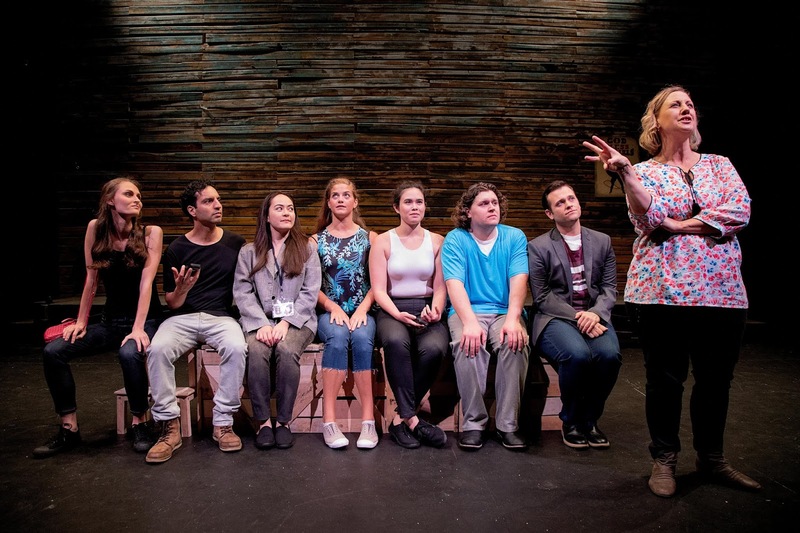 Over the past year they have developed this 60-minute play, TWO HEARTS. It comes from the conversations of the experiences of past personal relationships and their perception of how important the small details of their relationships became. Somewhere in a terrace house in Darlington: Girl (Eliza Scott) meets Boy (Damon Manns). Girl and Boy slowly approach a relationship. Girl and Boy have an intense relationship. Girl and Boy dissipate that relationship. Girl and Boy end that relationship. Girl makes a terminal decision. Boy accepts it. The end. This is not an unfamiliar genre in dramatic storytelling literature. It is, then, relatively, a 'boring' plot conceit. 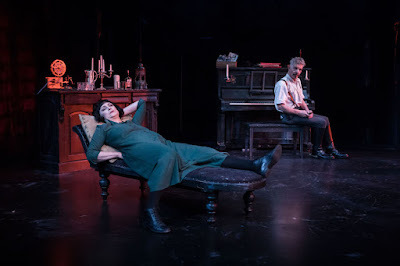 Although there is a strange figure (Phoebe Grainer) that 'haunts' the scene that doesn't quite crystallise either in the writing, direction, or performance as to have us understand her existence (function), which may have made TWO HEARTS a less predictable story experience. 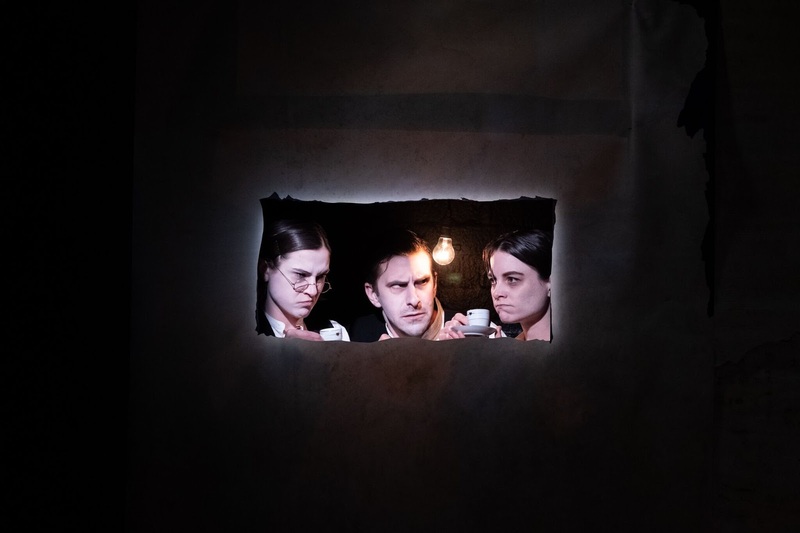 The strength of the night is the writing detail from scene to scene from Ms Lethlean - its preoccupations are indeed off-centre, quirky and refreshing, otherwise, it could have been a difficult and long hour in the theatre. The performances, elicited by Director, Ms Arthur, are adequate for the purpose but lack much depth of personal revelation interrogation from these actors that may have given this relationship story more resonance - the performances are sincere and in the case of Mr Manns, charming, but essentially are soap opera in their conceptual detail in expression. The Design, by Maya Keys is a simple raised rectangle covered with sea grass matting with the shadow of a fan - that may have had symbolic intentions as it slowed to a stop as the story unwound to its end. The Lighting is, by Martin Kinnane. The Sound Composition and Design, by Jess Dunn. Red Line Productions and Old Fitz present, DEGENERATE ART, by Toby Schmitz, at the Old Fitz Theatre, Cathedral St. Woolloomooloo. 18th October - 4th November. DEGENERATE ART, is a new Australian play, by Toby Schmitz. DEGENERATE ART, is a 100 minute play without interval. An interlocutor, played by Megan O'Connell, introduces us to a group of men, dressed in variations of contemporary schmick black, who have been brooding about the stage as we entered, occupying a Set Design, by Maya Keys, of a wall smear of, mostly, green and black paints (one part of it hung like a picture, free air, in a gallery) with two contemporary small screens on the side walls, that during the proceedings will display AV images of art and location that will elucidate some of what is going-on (AV Design, by Aron Murray), the whole lit moodily and dramatically by Alexander Berlage. There is, as well, a subtle Soundscape from the indefatigable (and super-sensitive, intuitive) Ben Pierpoint. These men turn out to be Adolf Hitler (Henry Nixon),and most of his principal and influential henchmen: Heinrich Himmler (Guy Edmonds), Joseph Goebbels (Toby Schmitz), Herman Goering (Giles Gartrell-Mills), Reinhard Heydrich (Rupert Reid) and Albert Speer (Septimus Caton), and what we experience is the journey of the rise of Nazism in the Fascist atmosphere of Germany from approximately, 1933- 1945. Mr Schmitz's play is told through the lens of the importance of Art (plastic, film, music) to the regime - stemming, perhaps, from the personal fact that Adolf Hitler was twice rejected as a student to Vienna's Academy of Fine Arts ( he couldn't draw heads, we are told.). It is the story of the so-called Degenerate Art movement, the looting and hoarding of great art objects, and features the making of a film called TITANIC, and the dreams of Hitler/Speer in creating a great architectural wonder city. Fascinating, too. Putting minorities in detention camps is the norm again. As is the careless employment of incendiary language straight out of the Nazi Handbook. Racism has returned to the lives of many, from Moscow to Calais, Washington to Canberra, from London to Melbourne. Nazism didn't end in tragedy, it created tragedy. And when Politics fails to curtail it, as it has and will again, the Art must be employed to expose it. Urgently. Hitler can be seen as a man without real character, rather a black hole at the centre of Nazism - an angry jealous artist - rejected and vengeful. To this end it was through reading Gitney Sereney's 1995 tome ALBERT SPEER - HIS BATTLE WITH TRUTH, and the literary fiction of Jonathan Littell's THE KINDLY ONES (LES BIENVEILLANTES, translated into English in 2009) of the auto-biographhy of 'Maximilien Aue', an officer in the Nazi army, that I began to realise the human scale and horror of ordinary men's capabilities in the pursuit of passionately believed 'ideals'. Does this happen with Mr Schmitz's play and production and performance at the Old Fitz? This textual combat, further, was not aided by the super energy of a co-hort of wonderfully erudite actors with vocal skills of an awe inspiring standard that produced (from 6 male actors) an alpha-male torrent of relentlessly hurled sound that buffeted us in our seats with its forcefulness. I found myself wrestling with the sound waves and grasping and gasping for sense, so as not to succumb to being drowned by it all - clutching for 'straws' of comprehensibility - one became bedazzled, discombobulated, exhausted. At the interval-less end of the production I felt that I had been run over by a large semi-trailer truck. "Clang", "clang", the searing warning siren of the horn, and all those huge wheels - "Whoosh!" hurtling towards me, squashing me. My guest was similarly tyre-dazed. We held our hands to get out, we were more than a little unbalanced. DEGENERATE ART, is a remarkable offer in the 'landscape' of our bland Australian theatre world. It is for the brave. It is for the interested and curious of the Nazi raison d'être. It is not for the casual theatre goer. It is not for the theatre goer looking for a light distraction. Do not drink in the bar before you go in, and, depend, you will need the bar after you come out. I long to read it. I long to see these remarkable actors invested with so much committed passion in their next work of art. On reflection, maybe, just maybe, The Old Fitz Theatre is just too small a space to take the scale of the performance art that this play demands. Then, again, DEGENERATE ART is not a 'commercial work' that any of our subsidised companies, in Sydney, would (could) possibly consider to exhibit. So, thank goodness for Red Line and the Old Fitz, for their artistic curation, otherwise we'd never have got the choice to witness the latest Toby Schmitz labour of love: Writer, Director and, belatedly, actor. It is dense and definitely overwhelmingly intense.